Quad S-1 review | What Hi-Fi? When we think of Quad speakers, our thoughts immediately turn to the ESL-2812 – massive electrostatic speakers costing upwards of £6000. 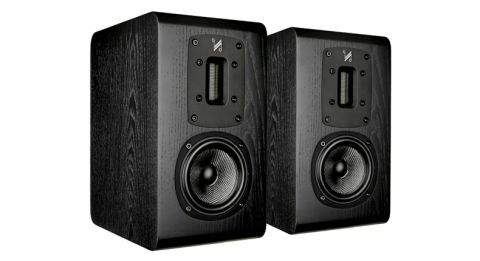 From now on, we’ll have something else to salivate over, because the company has come up with a fabulous pair of mid-range standmounters: the Quad S-1. It is the smallest of Quad’s new five-strong S-series, which comprises two bookshelf models, two floorstanders and one centre channel. If the S-1 is anything to go by, we can’t wait to meet the rest of the family. It’s love at first sight. The exterior is exquisite, with quality woodwork that brings to mind a fine dining table. Our review sample is black but the S-series also comes in a lush mahogany. Quad says it is also planning on glossy piano black/white finishes. Whichever finish you pick, you get rounded front and rear edges (the side edges remain straight). It’s an unusual move, one that helps the S-1 stand out of a line-up. Quad claims no acoustic benefits – it just looks nice, and there’s nothing wrong with that. No, the acoustic tinkering comes from the cabinet’s construction, which sees MDF sandwiched with high-density particleboard. This is supposed to reduce panel resonance and colouration. Elsewhere, the S-1 features a bespoke 12 x 45mm ribbon tweeter and a 100mm Kevlar cone for midrange and bass. The floorstanding models in the S-series also feature rear passive radiators for bass. The S-1 makes do with a small reflex port at the back. Quad recommends a minimum distance of 20cm from rear walls, and 30cm from side walls, toed in towards the listening position. Don’t be tempted to stick them right out in the open, especially in a large room. The S-1s are only little, and they rely on the rear wall for some reinforcement. The standout element here is the vocals. The way the S-1s handle voices is, in a word, lovely. Two words? Seriously lovely. Whether you’re listening to Prince, Sufjan Stevens or Devendra Banhart, the performance has the same intimate quality that makes you want to dig out all your songs. You get heaps of subtle detail and remarkable clarity; a treble that is insightful and agile; a midrange clear, direct and smooth. The integration between the drive units is terrific, never giving the impression that they are not working in tandem. Tonal balance is good, with no part of the frequency range sticking out to distract. These are rhythmically precise, well organised speakers. There’s a great sense of momentum. The sound is spread wide, with a good sense of space and placement. Compared to larger rivals, the S-1s struggle to convey a sense of authority. But for the size, we wouldn’t expect them to have the scale and dynamics of the B&W 685 S2s. Put on Massive Attack’s Angel, and while the Quads possess a decent amount of weight, they don’t quite convey the ramping sense of menace in the song’s opening section. Then again, the B&Ws don’t have the Quads’ way with vocals, or their finesse either. A word on kit matching. It’s worth noting the Quad S-1s have a sensitivity of 84dB, which is a little lower than average and makes this a relatively insensitive design. You may need to work your amp a little harder (or have a powerful one). We have the good fortune of listening to a lot of products, and the best ones are those that allow you to take leave of your critical faculties and leave you with music. This happened often with the Quad S-1, whose way with vocals is simply enchanting. They’re not about to muster much authority, but we don’t think that’s a big deal when you’re already listening with rapt attention. If you have a smaller room and you like your performances intimate, these are an absolute treat.